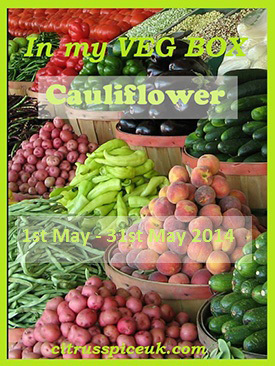 Ok its that time to share the roundup for the May linky for ”In my Veg Box” an event run by Nayna Kanabar of Citrus Spice UK. 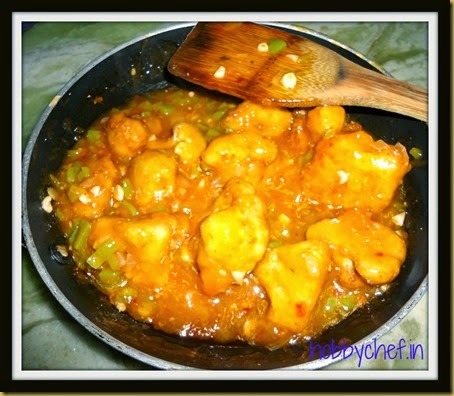 The theme was Cauliflowers and I am happy to say that a large variety of recipes were created by you and shared.Read on and enjoy,theres even an award winning recipe in here by Nayna! 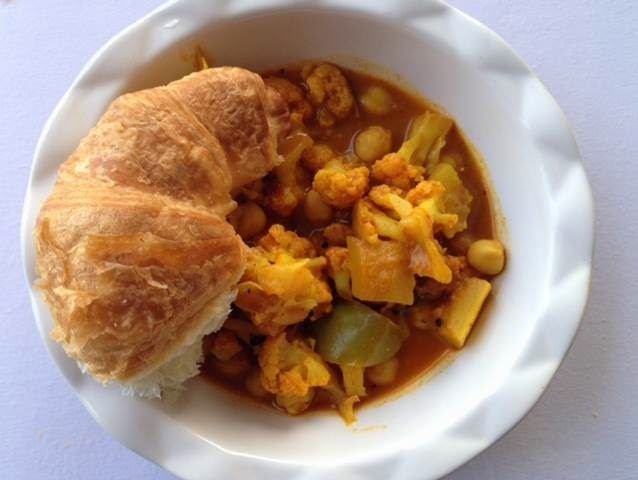 My very first entry is from Sudha Neelam from her blog ‘Spicy Quiry Serendipitous’ .Her cauliflower and chickpeas stew recipe is a spicy,thick,zingy recipe with thai red paste and comforting coconut milk .This scientist mum has shared a very beautiful part about her life and who all working mothers experience separation anxiety, reminds me of how my sister got back to work after having both her kids ,especially after her first baby when she braved Mumbai rains, the rush hour on her train journey and really slogged hard.She is my friend ,my philosopher and guide , but mostly she is someone I admire deeply for her steely determination, her ability to keep her family together and still achieve loads in her career. 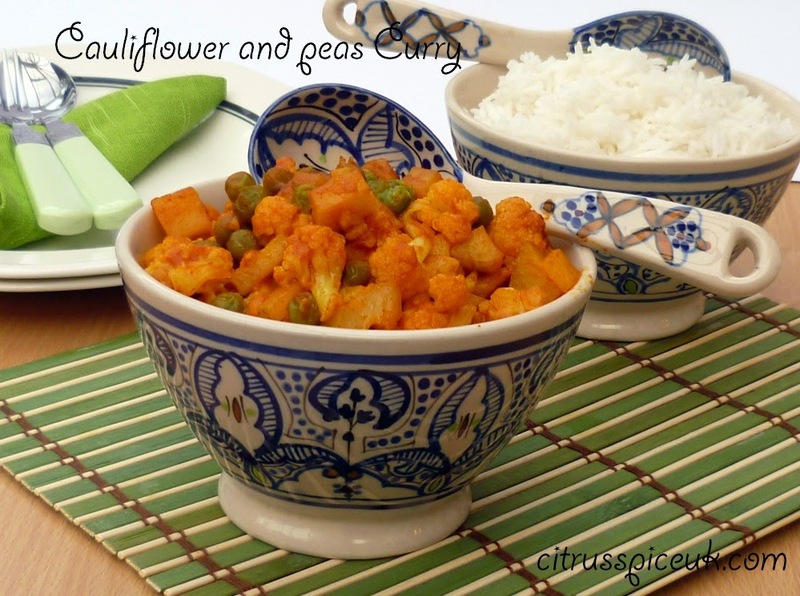 Next up is a very easy and tasty recipe for Cauliflower and green peas curry by Nayna on her blog Citrus Spice UK.This robustly flavoured curry is a fabulous addition to any menu, just as good with a hot roti as it is with rice or pulav ,a very worthy addition on the menu when hosting a vegetarian dinner party I think. 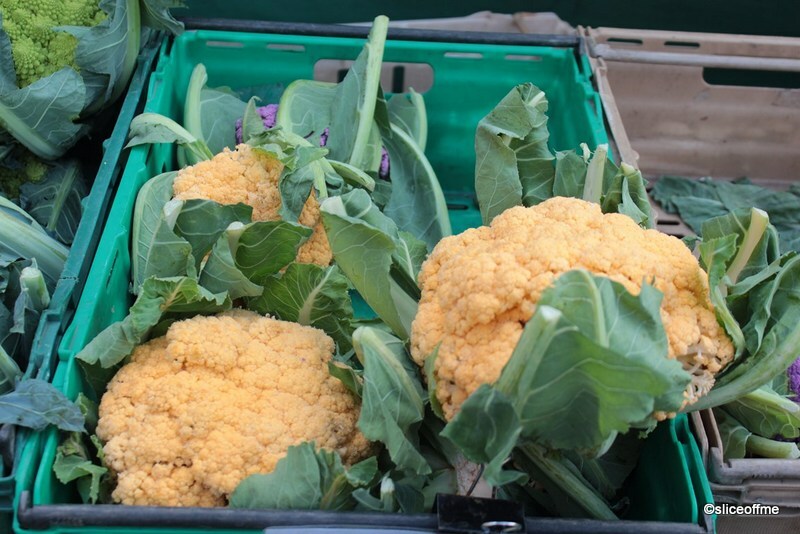 Another cool link up from Nayna , her recipe for ‘Spicy Cauliflower Tempura’ won her the runner up prize in the National Vegetarian week– Betta Living ,held during 19-25 May 2014. Nayna winning entry got her a whooping prize money of £250 prize! woohoo! Well done Nayna! Proof that cauliflowers rocks and vegetarian recipes are far from boring and actually require more creativity and culinary expertise to create flavour from simple ingredients! I also think the photo below is really beautifully done,agree? 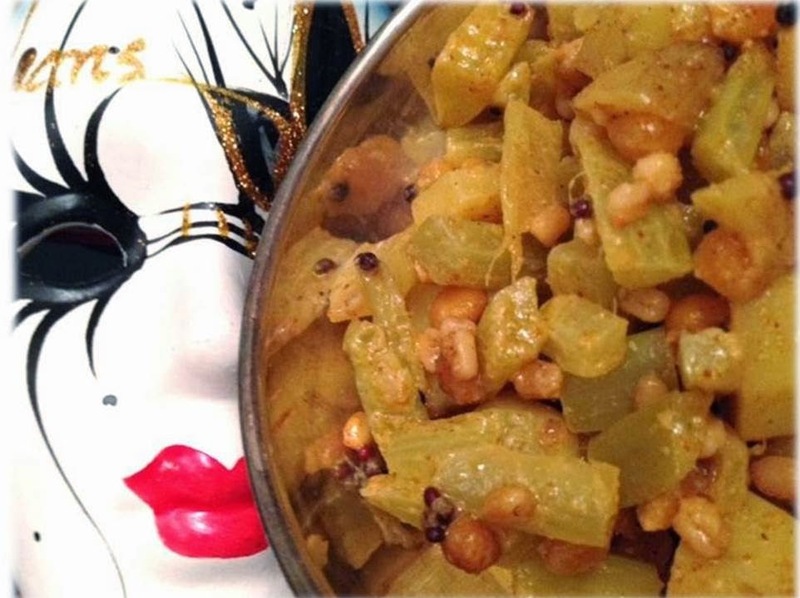 Linsy who blogs at Real Home Cooked Food has shared a tangy pickle based recipe for Aachari Cauliflower, Chana and Corn / Cauliflower , Chickpeas and Corn in Pickle spices. 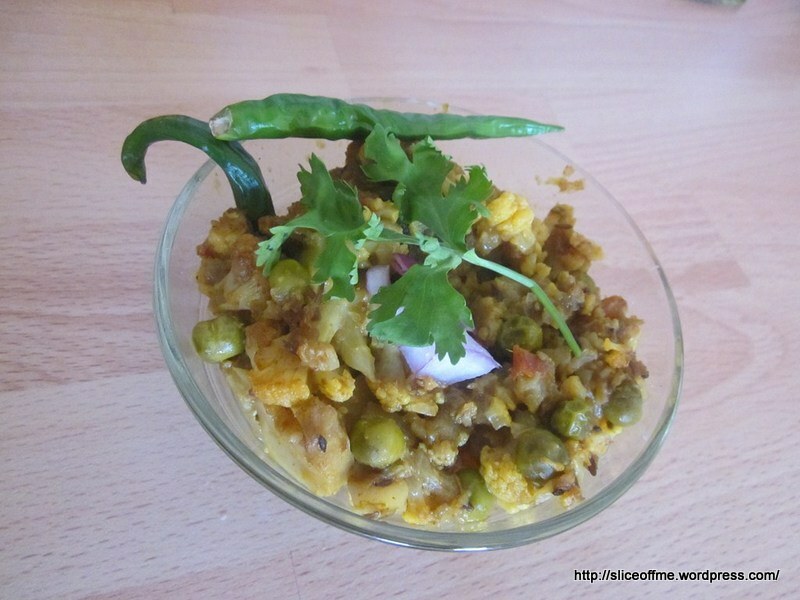 I love using pickle as marinade for my meat dishes and cauliflower take sup the flavours so readily it is a satisfying eat this dish am sure. When I was in North Wales, hubster and I had fish and chips with a curry sauce at a dingy little place, the chips were blah but the curry sauce was super fab , ever since its stuck in some corner of my brain and everytime I pass by a fish and chip shop that does a fairly decent job I wonder if they have curry sauce on their menu.This Cauliflower Curry Sauce by Linzi of Lancashire is a minefield of all things good and wholesome. Its no fat,high fibre, can be made ahead and frozen for saving the day at a later date and is a fabulous way to hide veggies in a tasty sauce, if that wasn’t enough it is a versatile sauce which will go with meat ,fish or veggie curries. 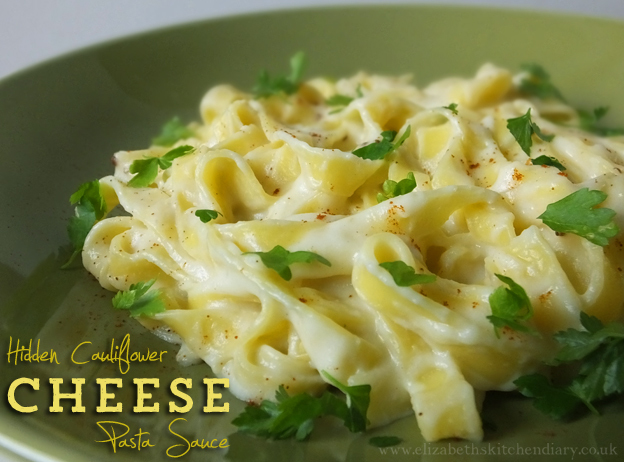 Up next another fabulous sauce this time a Hidden Cauliflower Cheese Pasta Sauce by Elizabeth of Elizabeth’s Kitchen Diary.I just happened to heard in great detail her about me section and discovered that we have both done our B.Sc in Lifesciences! I also went on to do a year of Masters in Biochemistry which I ditched and went for a MBA in Marketing when I realised I didn’t want to sit in a lab and talk to test tubes which I had named with characters from a fav sitcom 😉 Another beautiful food photo for the round up and another great recipe for making in extra portions and saving a mid week meal ! 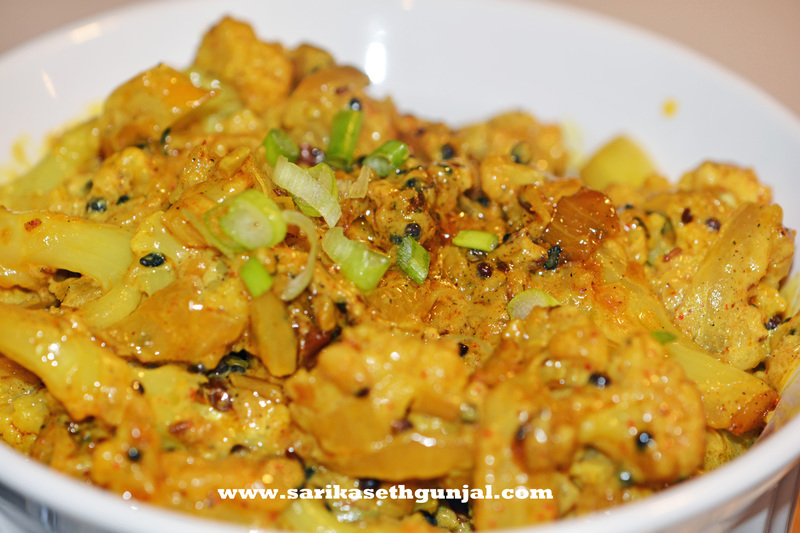 Shobhas Bengali style recipe for Bengali Style Cauliflower with Poppy seeds & Mustard Paste is simple curry but packed with earthy moorish flavours.I thoroughly enjoy Bengali food and a big fan of seafood which am sure you know by now if your read my post regularly. 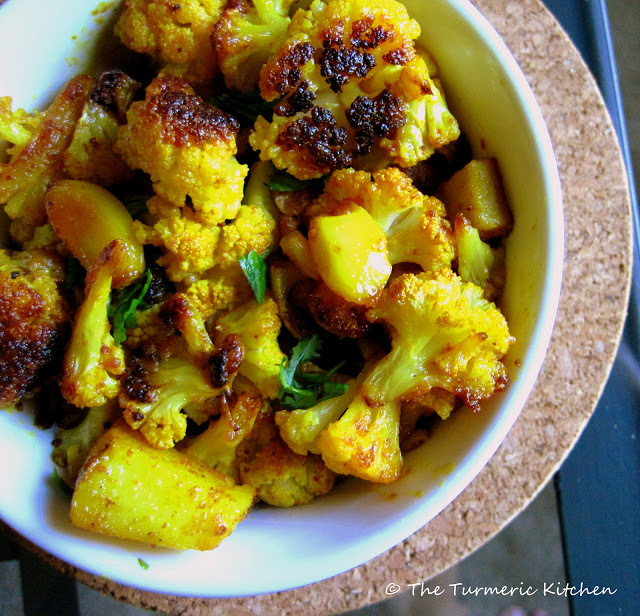 Jagrutis recipe for Spiced & baked cauliflower bhaja from her blog the Turmeric Kitchen came about as a result of being forced to rest up a sprained ankle hence its something that can be created in a flash and am sure will taste brill. I love the aroma of roasted cauli and roasted garlic. 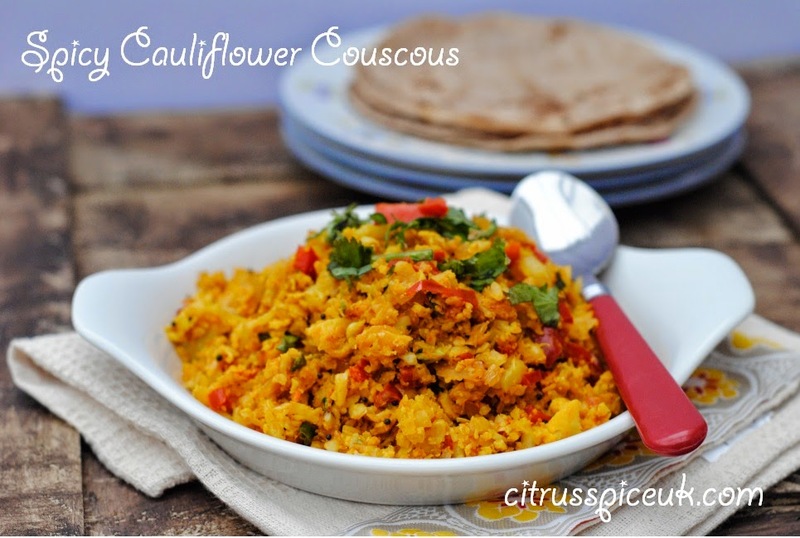 Nayna innovative recipe for Spicy Cauliflower Couscous is a clever way to use this versatile vegetable with a small amount of spices and get something yummy on the plate for everyone to enjoy. 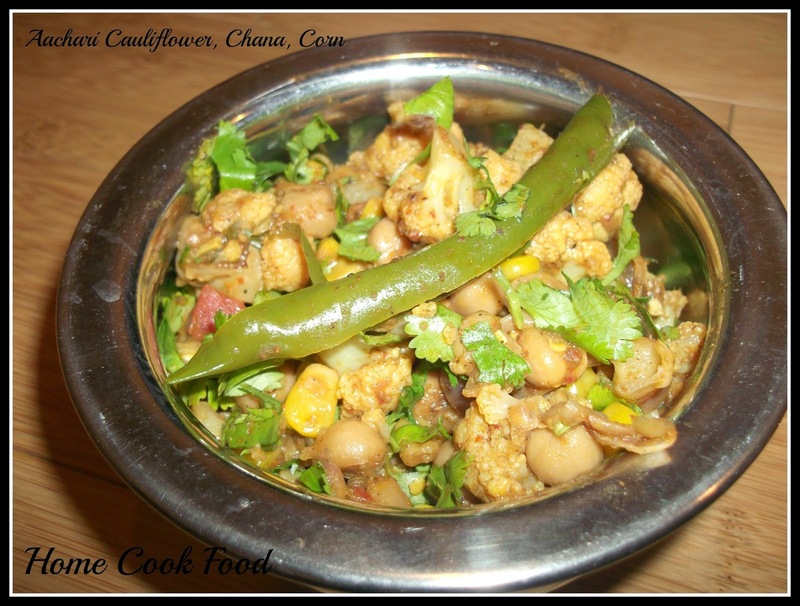 Another recipe for Achaari Gobhi ( Pickled Cauliflower) this time by Sarika is adapted from Sanjeev Kapoors original. 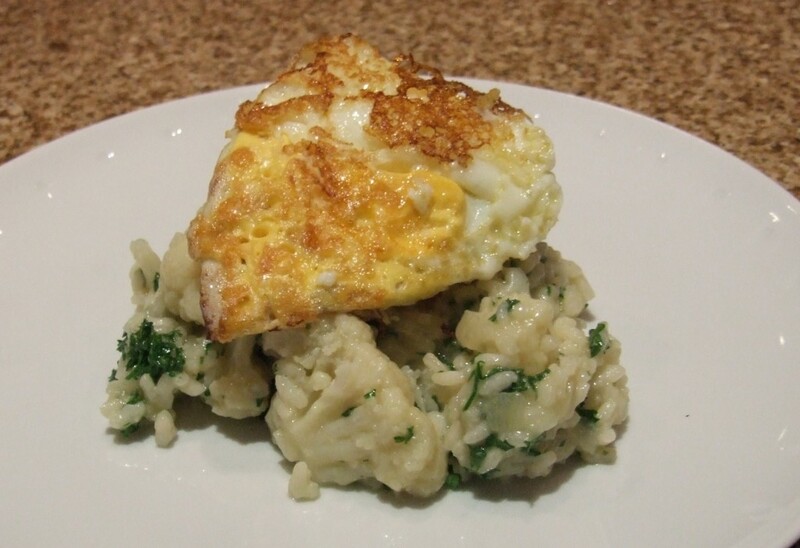 Helen who blogs at Famly Friends and food has shared a beautiful Cauli Risotto with crispy eggs recipe ,I love eggs in any form and risotto is my go to comfort food when I am in the mood for a creamy delicious treat. 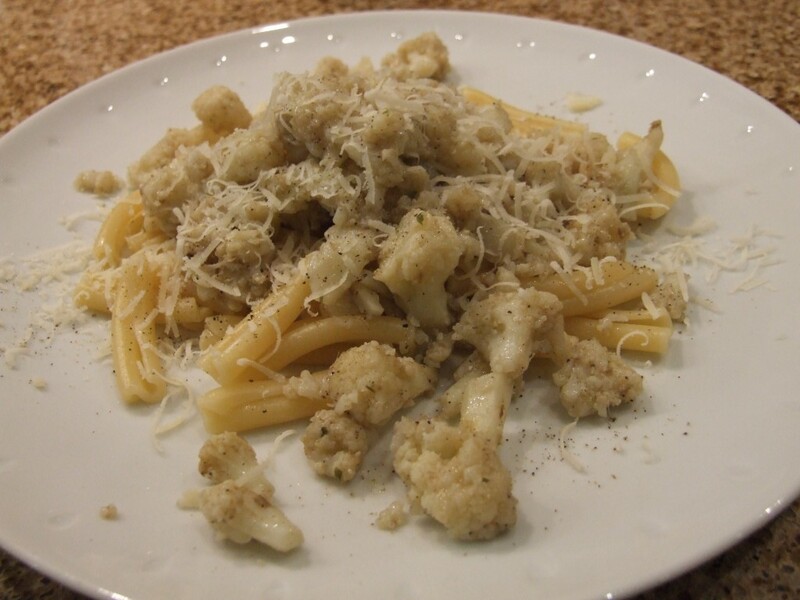 Another recipe from Helen this time a Cauliflower with anchovy and garlic , very unusual combination with anchovies I must say ! 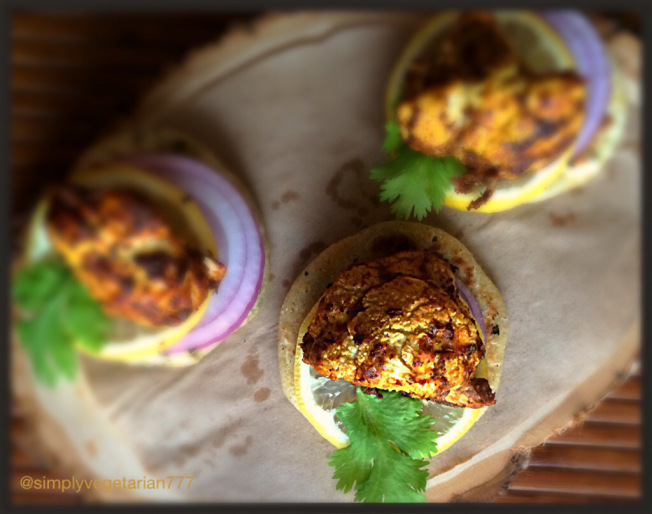 Sonal who blogs at simplyvegetarian777 has shared a recipe for Crunchy Gobhi Tandoori .Great idea for a summer BBQ party don’t you think ? Lastly my everyday recipe for a vegetable I like to have at least once a week with warm soft chapatis. 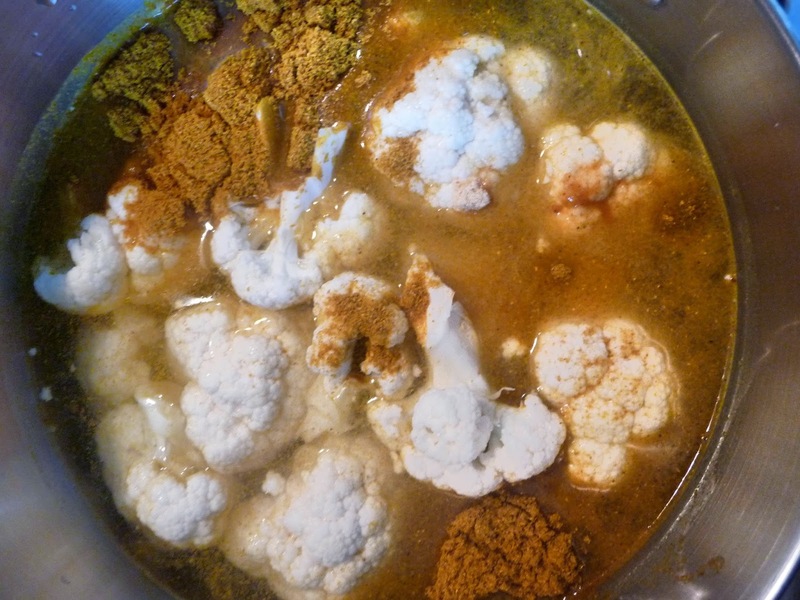 I hope that this round up leaves you inspired to experiment with cauliflower and try any one of the many lovely recipes. Thanks to Nayna for letting me host this exciting linky event. What a lovely round up! You put a lot of work into this and it really shines through, thank you! 🙂 Such a lovely collection of cauliflower recipes – I won’t be at a loss as to what to do the next time one arrives in my veg box! What a fabulous round up – with recipes as tasty as these you simply don’t need meat! I fact have an enormous cauli in my fridge waiting to be cooked! 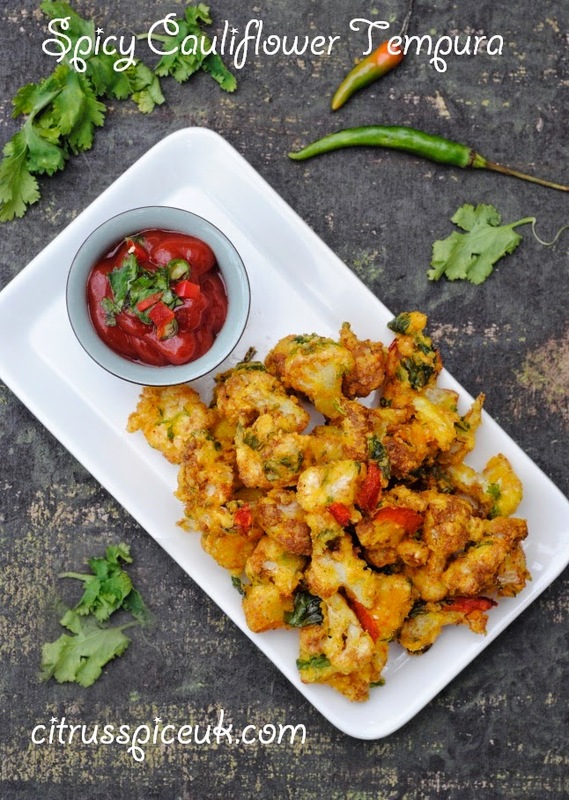 Ah the sound of that enormous cauli sounds so good to me Emma, am so in the mood for Tandoori Gobhi but the weather doesn’t seem to be leaning towards sunny today does it ?! I always end up making cauliflower cheese, so this is just what I need. I don’t think I’m going to be short of ideas as to what to do with cauliflowers ever again. Great round-up. Thanks Choclette,I agree, so much creativity and talent in these recipes sent out by the participating bloggers. What a fantastic round up and collection. Thanks!I loved all the recipes and am happy to see such a varied collection! :). 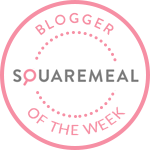 Manjiri, I am co hosting a soup event with another blogger friend for the month of June. Do check it out and see if you want to participate. 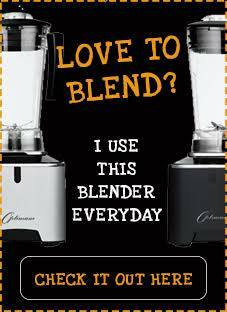 Some fabulous recipes here – thanks for sharing these with us! Thanks Selma, agreed some really creative recipes in here!